Full disclosure: I'm a statistician in my day job. I believe in science, I believe in data, I believe in biology, and I believe in humans' abilities to discover the how and the why of things through science. So the latest offering from Theatre Unbound (a company committed to presenting theater by women for women) is right up my alley. In fact, I was wearing a T-shirt that said "Got data?" last night when I saw the play, having just come from my company's Pi Day celebration. 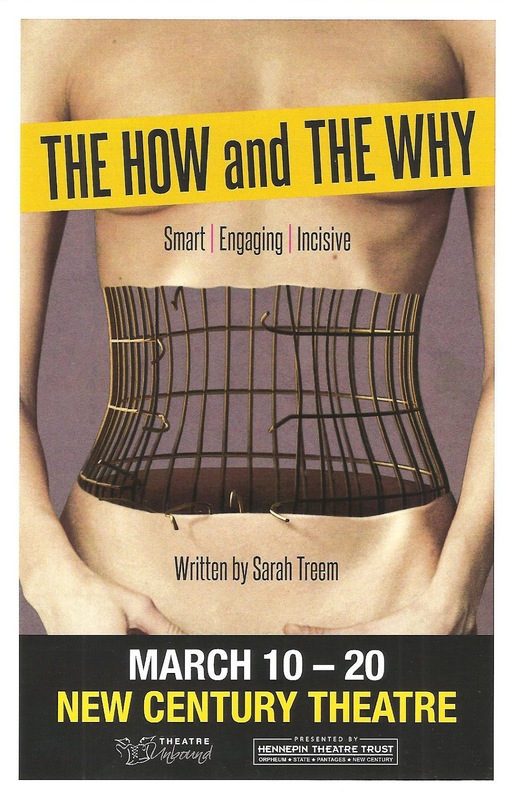 And what better way to continue to celebrate science, as well as Women's History Month, than with the new play The How and the Why about the relationship between two women scientists. This is one of those two-people-sitting-in-a-room-talking plays that I love so much (see also Freud's Last Session), especially when the talk is so smart, fascinating, engaging, and thought-provoking. This play may be about women and created by women, but it's one that can be enjoyed by anyone, and I'm grateful to Theatre Unbound and Hennepin Theatre Trust for bringing it to us. 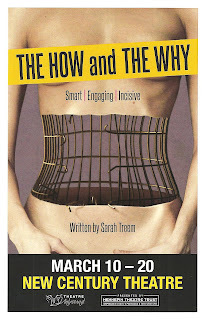 The How and the Why was written by Sarah Treem, co-creator of Showtime's deliciously dark and soapy drama The Affair, and that show's sharp dialogue and emotional situations can definitely be seen (and enjoyed) here. The play introduces us to two evolutionary biologists at different stages in their career. Zelda is a tenured professor, having achieved early success with the development of the Grandmother Hypothesis (which is a real thing) to explain why menopause occurs in humans but not other mammals. Rachel is a grad student at the beginning of her career, and thinks she has an equally important idea in her theory of why human menstruation is longer and heavier than other mammals. But biology isn't the only thing these two women have in common, or rather, another kind of biology ties them together. I don't think it's much of a spoiler to say that Zelda is Rachel's biological mother who gave her up for adoption at birth, since it's obvious in the first few minutes of their encounter. The two women discuss their theories, how they're related and contradictory, and eventually get into the difficulties of their own lives and relationship. I don't believe I've ever seen either of these two actors on stage before, and they both left a very good first impression. Caroline Kaiser plays Zelda as a strong, confident, secure woman, but eventually allows her vulnerability to peek through. Molly Pach's Rachel is every bit the nervous and unsure young scientist, excited and confused about life and her career at the same time. Both give very natural and sympathetic performances as these two complicated women, and they have a wonderful and believable chemistry. Set designer Lin Mathison has continued the welcome trend of building out New Century's usually wide and shallow stage into a thrust square, allowing for a more three-dimensional space in which this story can play out and bringing the audience closer to the intimate conversation. The first act takes place in Zelda's office, then transforms during intermission into a neighborhood bar, both simply but effectively represented. This is exactly the kind of play I love. The front of the program lists the three words smart, engaging, and incisive, and this play definitely succeeds on all three counts. I was intellectually challenged throughout the play (nice theory, but show me the data! ), and also came to care about these women and their lives and challenges. And may I also say, it's refreshing to hear straight-forward non-judgmental talk about menstruation and menopause on stage, because it's a part of life for half of the population. And if that freaks you out, get over it, because it's normal and not scary or gross. But really, this play is not about menstruation or menopause, it's about relationships, life choices, gender politics, science, and love, and how all of these things coexist in our complicated lives. The How and the Why continues through this weekend only.